Police said Thursday that they are investigating the anonymous "Blood Stained Singapore" blog, which suggested Singaporeans should refuse to be served by Filipinos in restaurants, or "accidentally" shove them in crowded places. In a post titled "Filipino infestation in Singapore—5 point guide to showing displeasure without breaking the law", the blog also advised Singaporeans not to help Filipinos involved in traffic accidents. The blog, which surfaced on Google's Blogger platform in May, was no longer available by late Thursday. A Google spokeswoman said she could not comment on individual cases but confirmed that the US web giant removes material from Blogger that violates its policy on hate speech. The Filipino community in Singapore is estimated at more than 170,000, many of them professionals seen by some Singaporeans as rivals for jobs—a sharp change from a decade ago, when most Filipinos there worked as domestic helpers. Singaporeans make up just over 60 percent of the 5.4 million population, with a low fertility rate forcing the government to rely heavily on guest workers. The influx of foreign workers in general, many of them from China and India, has sparked a rise in anti-immigrant sentiment. The blog had triggered indignation among Filipinos at home and abroad, with some calling for counter-measures against Singaporeans. The Philippine embassy has urged Singaporean authorities to take action against the blogger. 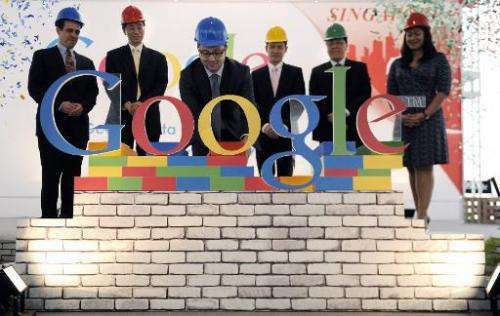 Google's decision to remove the blog drew mostly positive reactions from Singaporeans online, including the cabinet minister in charge of approving foreign worker permits. "Vile and vicious blogs like this do not reflect who we are as a people," Manpower Minister Tan Chuan-Jin said in a Facebook post. But others questioned whether the move stymied freedom of speech in Singapore. "Hooray for a democratic country which forcefully shuts the mouths of her citizens!" wrote Titus Lin on the Facebook page of national broadcaster Channel NewsAsia.